Our team of specialists and staff believe that informed patients are better equipped to make decisions regarding their health and well-being. For your personal use, we have created an extensive patient library covering an array of educational topics. Click on one of these diagnoses and treatments on the right or browse through them to learn more about the topics that interest you. Browse through these diagnoses and treatments to learn more about topics of interest to you. Or, for a more comprehensive search of our entire Web site, enter your term(s) in the search bar provided. Haglund’s deformity is a bony enlargement on the back of the heel. The soft tissue near the Achilles tendon becomes irritated when the bony enlargement rubs against shoes. This often leads to painful bursitis, which is an inflammation of the bursa (a fluid-filled sac between the tendon and bone). Haglund’s deformity is often called “pump bump” because the rigid backs of pump-style shoes can create pressure that aggravates the enlargement when walking. In fact, any shoes with a rigid back, such as ice skates, men’s dress shoes, or women’s pumps, can cause this irritation. A tendency to walk on the outside of the heel. After evaluating the patient’s symptoms, the foot and ankle surgeon will examine the foot. 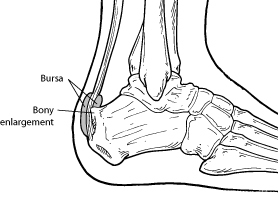 In addition, x-rays will be ordered to help the surgeon evaluate the structure of the heel bone. Medication. Oral nonsteroidal anti-inflammatory drugs (NSAIDs), such as ibuprofen, may be recommended to reduce the pain and inflammation. Ice. To reduce swelling, apply an ice pack to the inflamed area, placing a thin towel between the ice and the skin. Use ice for 20 minutes and then wait at least 40 minutes before icing again. Exercises. Stretching exercises help relieve tension from the Achilles tendon. These exercises are especially important for the patient who has a tight heel cord. Heel lifts. Patients with high arches may find that heel lifts placed inside the shoe decrease the pressure on the heel. Heel pads. Pads placed inside the shoe cushion the heel and may help reduce irritation when walking. Shoe modification. Backless or soft backed shoes help avoid or minimize irritation. Physical therapy. Physical therapy modalities, such as ultrasound, can help to reduce inflammation. Orthotic devices. Custom arch supports control the motion in the foot. Immobilization. In some cases, casting may be necessary. If non-surgical treatment fails to provide adequate pain relief, surgery may be needed. The foot and ankle surgeon will determine the procedure that is best suited to your case. It is important to follow the surgeon’s instructions for post-surgical care. Avoiding running on hard surfaces and running uphill.